Carter Newell Lawyers is an award winning specialist law firm providing legal advice to Australian and international corporate clients. Led by partners Patrick Mead, David Rodighiero, Luke Preston and Mark Kenney, the Construction & Engineering team acts for public and significant private companies in the mining, engineering, construction and property industries, including developers, main contractors, principals, sub contractors, suppliers and construction insurers. With a strong national reputation, the team is regarded as one of the most respected legal practices dealing with construction and engineering issues. Members of the Construction & Engineering team have a thorough understanding of the modern construction industry, with detailed knowledge of the way in which it operates. While we are experienced in handling large-scale litigation, we actively support alternative dispute resolution methods (including facilitation, mediation and arbitration) and have three accredited Graded Arbitrators and Mediators who provide specialist advice in this area. 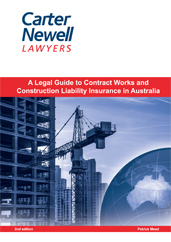 Authored by Patrick Mead, A Legal Guide to Contract Works and Construction Liability Insurance in Australia has been prepared for insurers, their advisors and other professionals involved in the construction and engineering industry. The aim of this book is to examine the issues arising from the interpretation of contract works and construction liability insurance policies by courts in Australia and the United Kingdom. Each Chapter explores different aspects of these policies through the use of case analysis and the judicial interpretation of policy wordings. Through the detailed analysis contained within the book, it is hoped it will afford the reader a greater understanding of the process of, and approach to, policy wordings by the courts.